Mangaluru, Sep 9,2017: Nevil Mascarenhas, a student of I PUC at Boscoss Pre University College, Mangaluru has bagged three gold medals in the 200m, 100ms and 50m backstroke in the district-level swimming competition held at SDM College Ujire on Thursday. 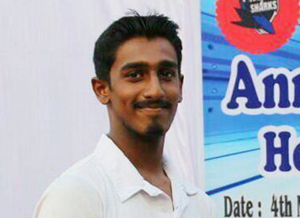 Nevil has been selected to participate in the state level swimming competition which will be held shortly. Neil Mascarenhas already qualified for the Junior Nationals Aquatic championship by clinching a gold medal in 50 metres breast stroke at the Sub junior and junior state Aquatic Championship held at Basavangudi Aquatic centre, Bangalore on 1st June this year.